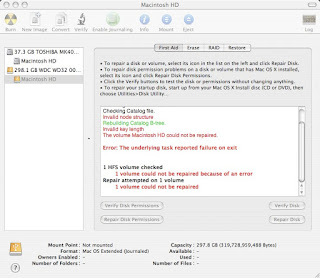 Jul 29 16:46:55 ibook-g4 diskarbitrationd: unable to repair /dev/disk1s2 (status code 0x00000008). 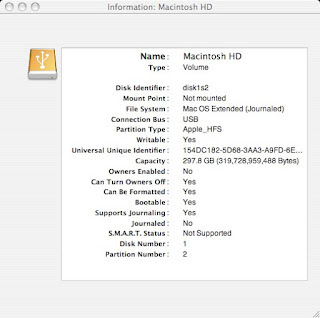 Disk manager shows that the disk can be correctly identified, but that it needs repairing. Oh - all the superblocks have gone bad. This is not good news. Jul 29 19:33:52 marwood kernel: [81897.007131] hfs: Filesystem was not cleanly unmounted, running fsck.hfsplus is recommended. mounting read-only. However, it can still be mounted (and the data copied off). This is what I decided to do. The filesystem on the disk is toast. So you managed to put the iMac back together? Yes, Mac back together and data provided on an external caddy.